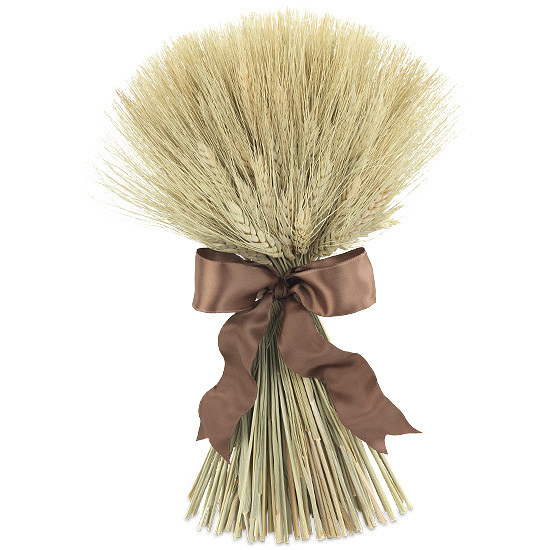 A sheaf of wheat is a traditional symbol of the harvest on Tuscan farmhouse tables. Our handmade version instills a sense of formality suitable for more citified settings as well. Simply yet elegantly tied with a shiny satin ribbon of rich chocolate brown, the abundant twist of natural bearded wheat will stand easily on end. We think they look great in pairs on mantels, sideboards, and buffet tables. To remove, simply snip wires from the back of the box and lift the item gently. Our preserved designs are originally produced with extra elements so slight shedding during transit is normal. The designs are best maintained when displayed indoors, away from direct sunlight, strong heat sources and extreme moisture. Please note: outdoor display is not recommended.